A cutting room is a separate area in a clothing manufacturer where garment components are cut out. The accuracy and efficiency of cutting room operations is critical to all subsequent operations and to final garment quality. 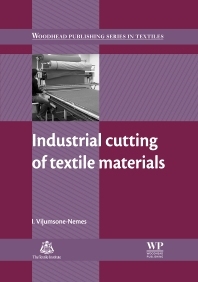 Drawing on the author’s extensive experience, Industrial cutting of textile materials summarises good practice in cutting room operations. After an introduction, the author reviews initial steps such as unloading, sorting and quality control of materials. She then discusses subsequent operations from lay planning and marker making, through manual and automated spreading and cutting, to fusing of cut components and final work operations such as sorting cut components for sewing. Dr Vi?umsone-Nemes also discusses marker making, spreading and cutting of more intricate fabrics such as striped fabrics and fabrics with check, motif and border patterns, narrow lace and pile fabrics. Industrial cutting of textile materials provides essential knowledge about cutting processes to designers, technologists, and managers to help in improving product quality and in controlling production processes effectively.